February 14th is approaching quickly! If you’re planning a Valentine’s Day marriage proposal, Hadar Diamonds offers the most beautiful diamonds ranging from $1k to over $1M. Shop the Valentine’s Day Diamond Sale 2018 for a stunning collection of diamond and diamond engagement rings to ensure February 14th, 2018 is a day she’ll remember forever. Looking for larger diamonds at great prices? Shop the diamond sale here! For the woman with classic taste, we recommend the .71 ct GIA Certified Round Brilliant Diamond (no enhancements). With its top-tier E color and desirable SI1 clarity, this one is sure not to disappoint. Did we mention the Excellent cut of this diamond, which translates to incredible sparkle and life? For a Valentine’s Day Diamond Engagement Ring deal, pair with a 14K white or yellow gold Classic Solitaire setting for an additional $385. Do you want to want to express how perfect she is for you this Valentine’s Day? Nothing says perfection more than an Internally Flawless diamond! The .50 ct GIA Certified Round Brilliant, natural hpht diamond is exquisitely cut and full of brilliance. Of course, with GIA grades of G, IF, and Very Good on the cut, one would only expect beauty and sparkle! Although this diamond is stunning on its own, for even more ooh’s and ah’s, we love the idea of pairing the .50 ct with a Custom Designed Diamond Halo Engagement Ring by the globally recognized artisans of Hadar Diamonds. Are you looking for a graceful, larger diamond for under $2k? Consider the 1 ct Oval Brilliant, natural laser drilled diamond. While its actual weight is 1 carat, it measures like a 1.30 ct with superb brilliance! With a top-tier F color, and eye-clean SI2 clarity, this diamond is ideal if you want a highly affordable, natural diamond without sacrificing beauty and sparkle. This Oval diamond is gorgeous on its own merit in “The One” 14k Classic Solitaire setting for an additional $385. Or, if you prefer extra sparkle similar to Blake Lively’s Oval engagement ring, consider the “Genevieve” setting in rose or white gold. Looking for a special diamond? Hadar Diamonds has you covered from beautiful stones from $1k to over $1M. 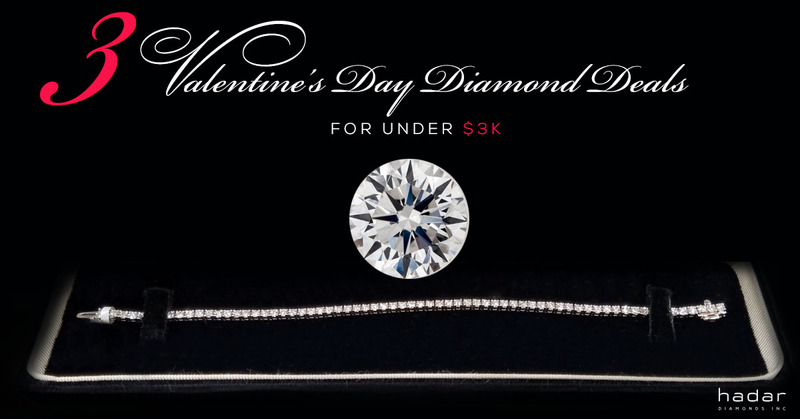 Inquire today for Valentine's Diamond Specials and Deals. Prices posted above valid through February 14th, 2018.